Laundry. If you are an adult, you do it. If you are anything like me, you hate it. If you are a lot like me... Some of us go to a laundromat, a place on campus, our parents' house, or our own basement, but laundry is something we all do and put money into. Even if laundry is the devil's game, it turns out to be a goldmine for bourgeois environmentalists like me. We make the same purchases over and over again to do laundry, and if we all switched even half of those buys, we could cut out a tremendous amount of waste. First, hang drying is so much more eco-friendly than using the dryer. I get that it isn't always possible, and it doesn't always make sense for life. On the other hand, if you can get away with some hang-drying, DO IT! You don't have to do it all this way but even a load or two a week can cut your energy bills and your impact. Need a cord? Try Great White, Xcords, or use American-made Paracord. Dryer Sheets are another one time use item that is basically instant garbage. They are also often covered in chemicals (read the box), and those chemicals (some potential carcinogens) get all over your clothes and you. It's cheap, but it comes at a high environmental price. The good news is that this is one of the easiest environmental changes we can all make! 1. Dryer Balls- You can buy these sets of dryer balls everywhere from Amazon to Etsy and they will last hundreds or thousands of trips through the dryer. So if you are the kind of person who throws a sheet in every time, a six pack of these balls will keep a whole row of boxes in the stores. That's less garbage for the dump and more money for you. 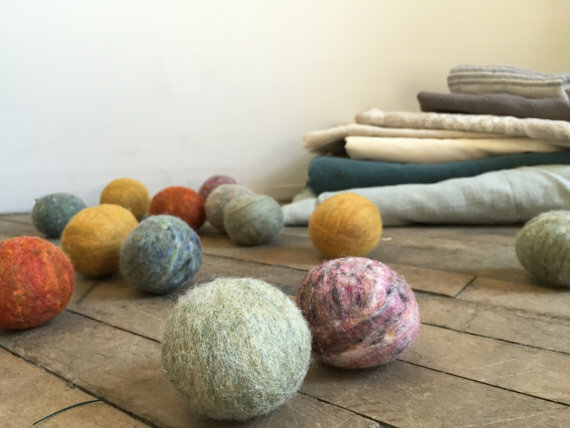 Wonderful Wool Balls (Much better name)- 15.95 for 6 Extra large balls- about 9 inches diameter. Mine are less than 6, so these balls must last forever. Ovella- 3 for 18- Made in Michigan in cute swirly colors. Part of Amazon's response to Etsy.Would make great wedding or baby shower gift. Feeling Fluffy Balls- 17.96 They say each ball will last at least a thousand loads. That's 6 thousand loads for 18 dollars. I hate to think I will even do that much laundry in my life. Kitchow- 15.97 for 8. Not as forthcoming about where they are made, but otherwise look good. LooHoo- 3 Pack for 27.99. Why so much more? The wool is from the US and they are made in Maine. They also come in pretty colors. Unvert- 6 for 14.99- Uses New Zealand wool and says it is organic, but maybe not the best option. Thirsty Sheep- 6 and a storage bag for 19.99- These ones are rather small, but might be great with the storage bag if you are taking your laundry somewhere to do it. Woolzies- 6 for 18.95- I think these are the ones I got for a gift (MIL, correct me if I am wrong). Made of New Zealand wool in Nepal (I found a couple others Nepal-made. No sign it is fair trade though, so I am not sure how the vulnerable people there are treated as employees). Want to buy them on Etsy instead? A Little Green Bee is on there (and slightly cheaper if you go for the larger sets), You can also try Bog Berry Handicraft, Redhead and Blue, Flatland Alpacas, and Pasta Quilts for balls that make for adorable gifts. Plastic dryer balls are also reusable, but aren't nearly as eco-friendly. When in doubt, choose the thing that isn't plastic. As a side note, I know my mother-in-law mostly likes the balls, but every so often she misses a drier sheet. If you have a particularly static-prone set of clothes, maybe keeping one box just for such occasions will help? If you only use it once in a very blue moon, I bet that one box can last forever. As a second side note, watch out for toddlers if you have these. They see them as very fun toys and will steal them from you. You remember when the little detergent packs came out, and how they felt like such a step up? Why can't we pour our own detergent again? The packs are kind of cute (I like the swirl on the tide) but they turn out to be somewhat dangerous for little ones and pretty wasteful fir all of us. They also come (like almost everything in the laundry aisle) in plastic jugs that create a ton of waste. How many do you throw away in a year? Now multiply that by everyone you know. That's all landfill and our water. So basically, laundry soap leaves a lot of room for improvement. 1. Make your Own- Making your own detergent is a relatively common practice, you can find tons of organic and low-cost recipes online. Thank goodness for Pinterest. You could make enough to last you a year or start with a small batch and see how you like it. Another awesome way to be eco-friendly and save money all at once! 2. The Simply Co- This zero-waste company is one of my favorite finds this year. 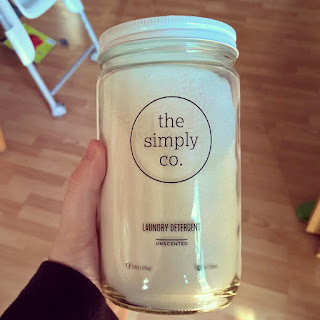 The formula they use is simple, the packaging is all glass and recycled paper, and our first jar was enough for 4 months of laundry in a house of three people (one of which is a slobby toddler). It didn't handle every stain, but we will just put dawn dish soap on the stuff that looks really rough, and that does the trick. We save money and I would never go back. 3. Other Clean and Homemade Detergent Companies- Etsy has tons of options for handmade laundry soap, so I will go through some with the most responsible packaging and lots of good reviews- Brighton Wool and Honey (Ohio), Green Bubbles Home (Nebraska), Shadelily Home Arts (North Carolina), The Bubbly Kettle (Kentucky), JMC Handmade (Connecticut), My Manoa (Hawaii), SOL Powder (Ohio) and Autumn Moon Soap Company (Pennsylvania). We have used this last soap (I was sure I was going to make my own, but started here to see how homemade worked) and it was really great as well. 4. Eco-Friendly Cleaners (in as large a size as possible)- Ecos sells a detergent with minimal chemicals (though where they do this and the materials of the packaging are unclear. Seventh Generation makes highly concentrated non-toxic detergent that you can buy in bulk as well. Biokleen is non-toxic, 3x concentrated, as well and its the only one that is proudly made in the US. 5. Buying in BULK- Love your Tide but want to do a little bit better? I still have got you. Buy it in the bulkiest bulk you can find. Natural Homelogic sells my favorite of these options (though their biggest bottle is 50 oz)- it's made in America, toxin-free, organic, and highly concentrated. The biggest Tide I could find on Amazon was 150 oz, but I bet larger ones are available at Costco. Powder is almost always more efficient if your machine can use it. For an ironing board, you can find them made nearby! Check Homz Durabilt or Homz T Leg. Need a steamer? Jiffy Steamers have been made in America for decades! We have one, and it is awesome. 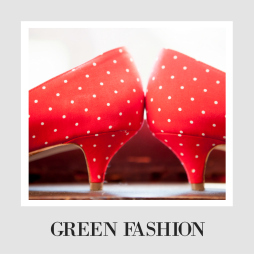 Want to green some other basics? 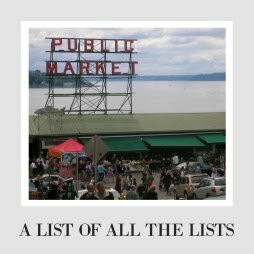 Check the list of all of our shopping lists! I am very interested to learn more and more about Bulk Candles. Your site is very much helpful to give us latest information on Wedding Candles.